With lots of people busy with vacations and other summer activities, July will be a fairly quiet month in the metro Atlanta raqs community. Don't miss Crossroads & Origins! If you can't make the workshops, the show is going to be absolutely amazing. Sulukele's weekly series of costuming classes continues with a mermaid skirt workshop. A two-day intensive (beginning with dinner Friday evening, catered by Nicola's) with two master instructors and performers, Amel Tafsout and Artemis Mourat. Gala show Saturday evening. A la carte pricing is now available! Register here. Produced by Ziah of Awalim Dance Company. Learn a belly dance/Polynesia fusion choreography. Click here for more information. Make a pair of harem pants in the final session of this series! 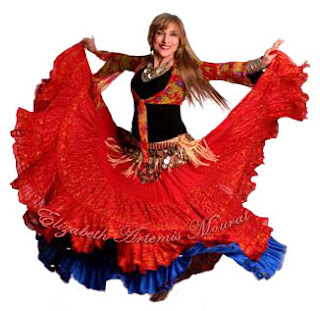 In celebration of National Dance Day, learn Samba with Andrea and Bollywood dance with Zaina Zahra, along with other international dance styles. Click here for more info. A Night in the Oasis: Summer Bazaar! Join a variety of local performers in the latest in this series of raqs showcases, produced by Mina and Mariana of Dalloua Dance.